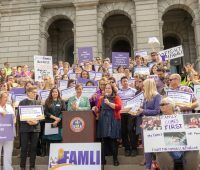 Business owners, working families, and policy advocates rallied Tuesday at the Capitol in support of a bill that would bring paid family medical leave to Colorado workers and their families. 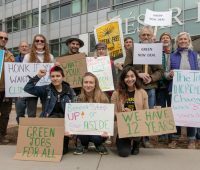 Environmental activists with the Boulder Sunrise Movement held a rally Tuesday outside of U.S. Sen. Michael Bennet’s (D-CO) office calling on him to support the environmental resolution known as the Green New Deal. 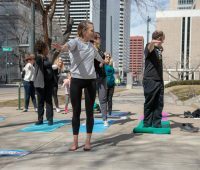 A group of progressive organizations rallied today in protest of Sen. Cory Gardner’s (R-Colo.) fluid stances on national and local policy debates with a yoga class in front of his Denver office. Angela Gover, a professor at the University of Colorado at Denver, will moderate the “Culture in Colorado’s Courts” discussion event on Wed., March 20. Last Monday, state lawmakers introduced a bill that would repeal a 20-year-old law prohibiting local city governments from setting a minimum wage in their communities. 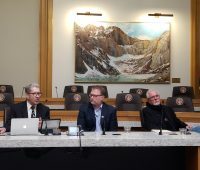 State Sen. Kerry Donovan (D-Vail) and State Rep. Dylan Roberts (D-Eagle) are co-sponsoring a bill that outlines a public health insurance pilot program aimed at lowering costs and providing more options for consumers in rural and mountain communities. 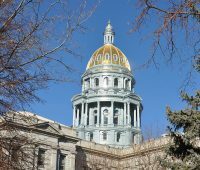 Tanya Mares Kelly-Bowry, Vice President of Government Relations at the University of Colorado, will moderate a discussion about the 2019 legislative session on Fri., March 1. Director of the Interfaith Alliance, Rev. Amanda Henderson, welcomes people to Faithful Tuesdays Photographed by: Peter Savic The second “Faithful Tuesdays,” a weekly event at the Capitol intended to “advance a moral economy, equity, and the eradication of racism now,” took place Tues. with speakers from advocacy groups calling legislative action for criminal justice reform. 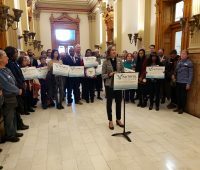 In an emotional if fact-challenged presentation, conservative talk-radio hosts took their campaign against an initiative to fight overdose deaths to the state Capitol on Monday.